MBABANE, Sep 20 2013 (IPS) - As Swaziland goes to the polls for the second and final round of voting in its general elections on Sept. 20, giveaways have become the order of the day in this southern African nation. Voters are receiving food parcels, blankets, booze and even cash from desperate candidates vying for a seat in the House of Assembly or parliament, despite the practices being against the country’s Electoral Act in this tiny southern African nation with a population of just under two million. Nothando Ndwandwe, a voter from Manzini, the commercial hub of the country, has received parcels of maize and beans from a campaigning candidate. “Members of parliament neglect us for five years and only return when they want our votes. It makes sense for the voters to cash in now,” she tells IPS. It is not surprising that voters are accepting handouts as about 40 percent of the country’s 1.2 million people live below the poverty line of 1.25 dollars a day, according to the United Nations Development Programme’s Human Development Index. The country is also recovering from a crippling economic crisis. Some candidates provide the handouts to voters as a way of electioneering during the primaries. Swaziland is a monarchy, ruled by King Mswati III, and political parties are not allowed to contest for power. Instead, 55 individuals are elected to the 65-member House of Assembly from 55 constituencies know as “Tinkhundla”. Mswati selects the other 10 members. Individual candidates contesting seats in parliament are not allowed to canvas for votes during the first round of voting. That was held on Aug. 24. The government also prevents candidates from debating on state-controlled national radio and TV stations. 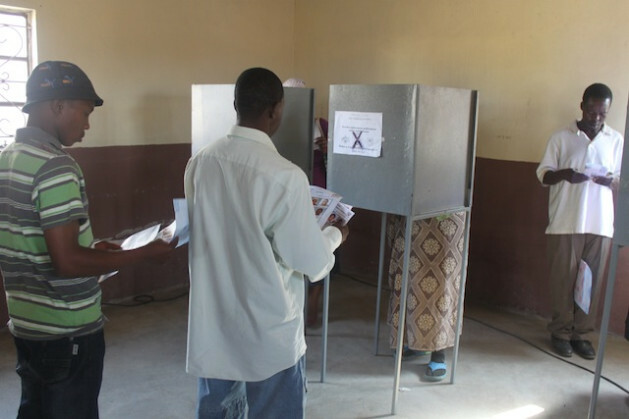 During the second round of voting, candidates compete in their constituency for a seat in parliament. It is only during this round that they are allowed to solicit votes. “It’s very frustrating because those who have money then start buying people food and booze as a way of campaigning long before the primary elections,” complains Nomcebo Dlamini, a candidate from Sidvwashini, in the capital city Mbabane, who lost during the primary elections. She tells IPS she would have stood a better chance if the Elections and Boundaries Commission (EBC) allowed candidates to start canvassing for votes ahead of the second round. “It’s worse for marginalised groups such as women and people living with disabilities because most of them do not have money to conduct the campaigns,” says socio-political analyst Thembinkosi Dlamini. Some candidates are struggling under the pressure of voters’ expectations. Meshack Makhubu, a candidate for the House of Assembly from Mpolonjeni, which lies just outside Mbabane, says voters are milking candidates dry. “Voters are demanding as much as 500 emalangeni (50 dollars) for a vote,” Makhubu tells IPS. “I can’t afford that kind of money.” He says that his financial circumstances put him at a disadvantage, as wealthy competitors are able to meet the voters’ demands. But Dlamini tells IPS it is not surprising that handouts have come to characterise the elections as Swaziland has a system of government that prevents its people from organising and growing together politically. “Individual merit places the risk squarely on the person running for parliament and they have every reason to want to game the system in order to succeed,” he says. Critics say these elections serve the King, and not the people, as he has an overwhelming representation in parliament and cabinet. The House of Assembly or parliament has no power as Mswati overrules decisions he does not like. Mswati appoints the prime minister and 20 of the 30 senators. The remaining 10 are elected by the House of Assembly. Mswati, who has 14 wives, each with their own palace, and whose wealth Forbes Magazine estimated at 100 million dollars in 2010, is accused of living in excess at the expense of the taxpayer. Corruption in the government is also high. In 2011 Minister of Finance Majozi Sithole said that 128 million dollars was lost annually through government corruption. The Swazi budget for 2012/2013 is just over one billion dollars. And with an unemployment rate of 40 percent, it comes as little surprise that many are eager to win a seat in parliament. According to the deputy director at the Coordinating Assembly of NGOs, Njanbulo Simelane, people have realised that they do not stand to benefit from their MPs. Musa Hlophe, the coordinator of the Swaziland Coalition of Concerned Civic Organisations, says people are forced to elect candidates they hardly know because they are not allowed to debate policy issues around the elections. Mdaka Kunene from Timphisini, northern Swaziland, says he has never seen any of the people who are contesting and when he votes he will just put a cross next to the face of someone likable. “My area is too big so it’s impossible to know the candidates without them canvassing for votes,” Kunene tells IPS. Hlophe adds that the EBC prevented some NGOs from conducting civic education campaigns to help educate the voters about their rights in the elections. “Under the present system these elections are never going to produce the quality of government that would bring positive change to the people,” says Hlophe.